In my 2015 Annual Review, I lamented the fact that I had let me health slip a bit in the last year. Okay, so I let is totally backslide. So looking forward to 2016, I made a commitment to myself to change that. In just a few days of being strict with my eating, training, and mobility work, I felt a huge difference in my mental acuity. I was working smarter and making much better decisions. But I didn’t want to do this alone, so I got in touch with my buddy Tim from Fit Dad Media and the Healthy Hero Academy to educate more entrepreneur dads about how we think about health and fitness. Tim Hull has devoted his life to studying the body and uses this knowledge to help his physical therapy and fitness clients to overcome obstacles and improve themselves. As entrepreneur dads, we are constantly looking for ways to improve our business and productivity. Yes, that’s right!….Taking control of your health and fitness is one of the best things you can do to improve as an entrepreneur. We spend countless hours chained to the computer, slaving over projects, and getting little sleep and our health takes a beating because of it. It’s a good recipe to end up sick, overweight and yes in an early grave. I am betting it would be hard to create that million dollar business then….But I’m not just talking about your health. When you’re not physically fit, it’s hard to be at the top of your game in business. By taking control of your health, you can improve your productivity, creativity, and decision making. 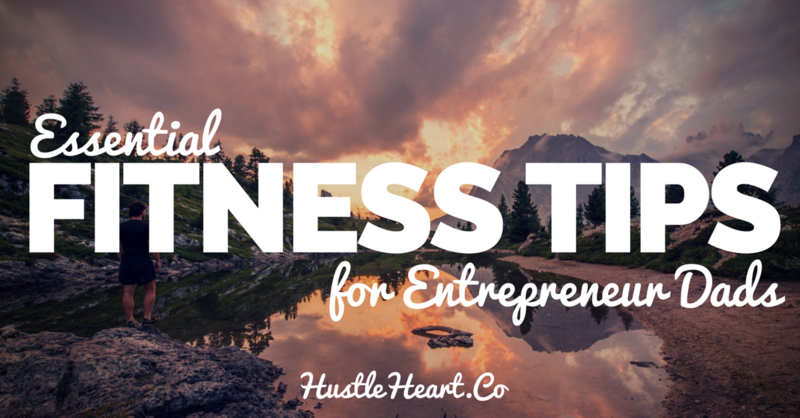 Just like when you started your business, you have to make a commitment to becoming fit. It won’t happen, unless it becomes a priority. In an effort to be productive and have more time to work on his business, an entrepreneur dad stays up half the night working on his projects. Before long, getting 4-5 hours (or less) of sleep becomes the norm. It almost becomes a badge of honor for some. What we don’t realize is the brain becomes less and less creative and productive as sleep decreases. You may think you feel good and are doing fine, but you are actually hurting your performance by limiting your sleep. Not to mention the health benefits from getting adequate sleep. As an entrepreneur, once we make a decision to do something, it’s natural for us to go all out. Unfortunately with fitness, going all in will burn you out quickly. The best way to be successful, is to start slowly, making small changes along the way. When it comes to fitness, most people think they have to be disciplined. However, discipline will only take you so far. For lasting change, you need to create healthy habits. Habits allow you to automatically perform activities without thinking about it. If you think about all your bad habits, I would bet you do most of them without even realizing it. A habit is formed by repeatedly performing the activity for around 28 days. To make that habit stick you need to develop a trigger. Think of it this way: When a smoker gets stressed (the trigger) they light up. When someone addicted to food gets bored (trigger) they reach for food. When I get stressed, my habit has become to do something physical (usually working out, hitting the heavy bag or hiking). Find a daily trigger that works for you. As you probably have heard before, a lot of successful people wake up early and have a very specific morning routine (habits) they follow. Most of us have really busy lives and we struggle with finding the time for everything. If you get into the habit of exercising first thing in the morning, you will be more likely to stick with it and be more consistent. As a nice side benefit, it also give you energy and a better mental outlook for the day. Sitting for long periods is rough on your body. I see many physical therapy patients in my office that have back or neck pain from sitting for long hours. I encourage you to set up a standing desk, where you can work on the computer while you’re standing up. Not only is this better on your body, but standing burns more calories then sitting does. If your not able to stand and work, at least take frequent “movement breaks” every hour. You take the stress off your body by getting up stretching and moving. You will also feel more refreshed and ready to take on that big project after moving around for a bit. Some people complain that they don’t workout because it’s boring to them. Don’t use this as an excuse…From martial arts to marathons, there are a million different ways to be active. Experiment, try a bunch of different things and find the something that you like to do. For me I love hiking, punching the heavy bag, and doing strongman style training…If you have fun doing it, you’re more likely to stick with it. Being fit and working out doesn’t have to be an isolated activity. I’ve seen people working on the computer while they walk on the treadmill and film a Periscope episode while riding a bike…Some of my best business ideas came while I was working out! In the spirit of multitasking, I encourage you to involve your family. This is something I have been doing more of lately. Not only are you improving the whole families health, but you get extra family time as well. It will keep you all motivated and may even improve your relationship. No fitness list would be complete without mentioning healthy eating. Just like fueling a race car, your body requires the right fuel for peak performance. Yes, you can get by with the fast food and junk most people eat, but you will be more energetic and your brain will work better with higher quality food. I won’t get into some detailed strategy here, but simply try to eat as natural as you can. Raw, all natural food is better then any processed food. Shoot for a serving of protein and veggies with each meal. At very least stay away from fast food. Well, there you have it: a few simple fitness tips to get you firing on all cylinders. I also wanted to add a bit of a bonus here at the end of Tim’s article, sharing what I’ll be doing in 2016 on days that I can’t make it to the gym for a proper workout. The goal with these kind of days is to maintain training momentum and maintain fat loss without being able to make excuses. Removing the ability to make excuses is of utmost important for entrepreneur dads because, with a growing career, side business, and family it becomes increasingly easy to skip workouts and ignore our health. For fat loss and muscle building, I have yet to find a movement equal to the kettlebell swing. Done twice per week for a totally workout time of 15-20 minutes, kettlebell swings are THE movement for athletic performance, especially those that require lower body explosiveness. By far, the largest barrier to doing the movement is the prohibitive cost of heavy kettlebells. Below is an awesome video of a $10 alternative. In this post, Tim Ferriss recommends starting with a 53lb. kettlebell (I just put 2 25lb. plates on my T-Bar) for a total of 75 reps. If you have to split them into multiple sets, then, please do so until you can complete 75 reps without stopping. Once you hit 75 reps for the day, you’re done. I agree with Tim simply because I’ve tried and tested these protocols out myself and found them to be surprisingly effective. I started with 3 sets of 20 and a final set of 15 for a total of 75 reps. I progressed to 3 sets of 25 and continued to reduce my sets until I was completing 75 swings in a row. Then, I added 5-10lbs to the kettlebell and started again with 3 sets of 20. When the swings get easy (they will), simply add reps.
For a winter workout routine, there is nothing better for the busy entrepreneur dad and kettlebell (T-bar) swings. Photos: Casey Neistat’s Tumblr. More on Casey, an awesome entrepreneur dad, here and here.